The 16th World Kendo Championship is fast approaching and kenshi all over the world are looking forward to the exciting tournament. 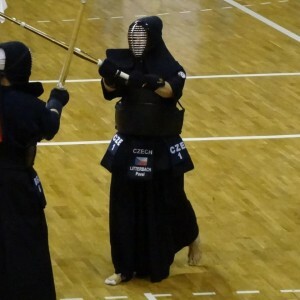 The championship is held every three years, and this year the event will be held in Tokyo, in the world-famous Tokyo Budokan, which was also the site of the very first World Kendo Championship in 1970. The first WKC had 17 participating countries, and since that time, the event has grown to its present size of 56 countries and territories. Atlanta Kendo Kai is lucky to have a member that will be competing in the upcoming tournament: Pavel Litterbach. Pavel began Kendo 10 years ago, and has progressed all the way to the rank of 4th Dan. When he participates in the WKC, he will be representing his home country of the Czech Republic. He practiced karate when he was younger, but he had always dreamed of doing a martial art with a sword. When he was 27, he was able to find Kendo and he hasn’t looked back. Pavel trains with Atlanta Kendo Kai three times a week, but he also let us know that he trains privately, or with friends and visitors, almost every other day of the week. He said that his private training focuses on stamina, execution of waza, and carefully analyzing and seeking to improve every detail of his technique. In order to join the Czech national team, Pavel had to compete in a series of elimination matches with other candidates. Several of the top kenshi were then selected to join in group practices, in order to evaluate their ability to keep up with challenging keiko, as well as their ability to gel with the team. Pavel was eventually selected to be one of the seven members to attend the WKC. When asked about Czechnational team practices, he told us that while the keiko menu is very similar to that of other dojo, a lotmore time was dedicated to kirikaeshi, uchikomi-geiko, and kakarigeiko. The WKC will be the largest competitive stage that Pavel has encountered. When asked about his goals, he said that for both the Men’s Individual and Team divisions, he would like to make it out of the initial group bracket. He would consider this to be a great achievement, both personally and as a team. Finally, we asked Pavel about advice for both kenshi looking to compete on an international level, as well as for those just looking to improve their own Kendo. He said that the most important thing is to never look for excuses. “Try to find a way to practice more, and push your limits farther each time.” He said that even in his relatively short Kendo career, he has seen people who seem complacent in their practice; they just show up and go through the motions, and as a result their Kendo looks empty. He said that it is important to always have goals, not just in Kendo but in everything we do in life. And we shouldn’t be afraid to set big goals for ourselves. He feels that “the bigger the goal, the greater the achievement will be.” It helps to set up small goals along the way, but we should keep the larger goal in mind at all times. We are very proud of our member Pavel for his achievements and we wish him the best of luck in the 16th World Kendo Championship!